Are You Australia’s Next Up & Coming Stylist? 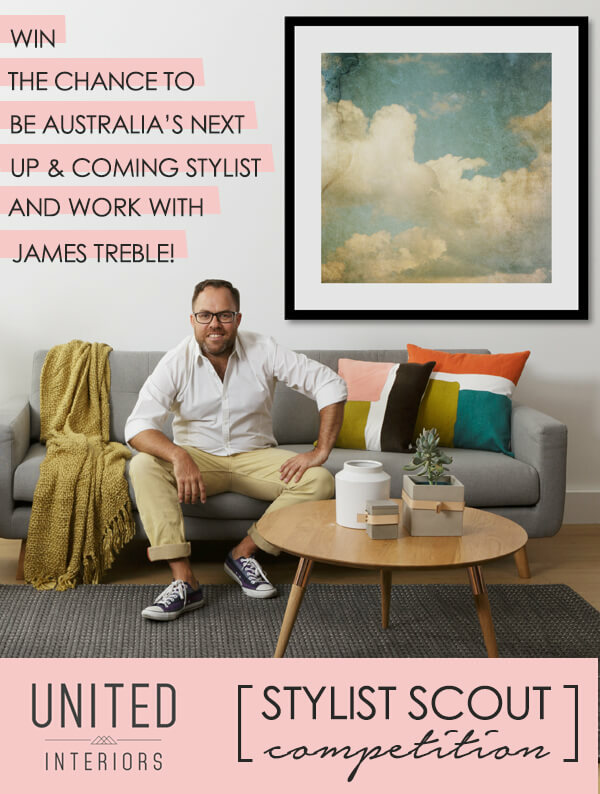 United Interiors are scouting for Australia’s next up and coming stylist and have teamed up with Jen Bishop from The Interiors Addict and our very own James Treble to launch an exciting new ‘stylist scout’ competition! Watch this short video to learn how you can get involved in the United Interiors Stylist Scout Competition. Even if you don’t want to take part, you still have the chance to win an amazing prize just by voting for our winner! If you’ve always wanted to be a professional stylist or you want to take your styling career to the next level, now is your chance! Not only will you win $1,000 to spend with us, but you’ll get to style our summer campaign with James Treble, and get paid for it! To enter the competition, simply share a picture of something you have styled (a room, a vignette, a moodboard; whatever you think best showcases your skills) on Instagram, tag @united_interiors and use the hashtag #unitedinteriorsstylistscout by 31 October. You’re welcome to email additional images of your styling to [email protected] by the deadline. Just make sure you include your Instagram handle. By doing this you agree to your email address being added to the United Interiors email database. On behalf of United Interiors, James will choose two finalists (announced on 2 November), who will be invited to the United Interiors Melbourne showroom on Sunday 6 November 2016 (flights will be covered where necessary but no other travel expenses or accommodation) to take part in a style off! Please make sure you can be available on this date when you enter. Each finalist’s look created in the showroom will be photographed and shared on Interiors Addict on 10 November and and open to a public vote from that date. Voting closes at midnight AEST on 30 November. The look with the most votes wins! And one voter picked at random, will win all the decor items in the winning image. The winner receives the chance to style United Interiors’ summer campaign (paid gig) with James at the end of the year, as well as a $1,000 United Interiors voucher. We can’t wait to see some amazing interior styling talents out there!